You may have just built a shiny new deck, or you might have had your deck for a number of years now. Either way, you’ll need to look after your decking if you want to preserve its look and lifespan. Outdoor decks are extremely exposed to the elements (especially if you’re based in the UK!) and the rain, wind, frost, snow & even sunlight are all out to spoil the aesthetics of your structure. High footfall & usage can also lead to general damage from day-to-day wear & tear. Exposure without maintenance can lead to discolouration at best; complete degradation at worst! Fortunately most issues with decking materials are cosmetic rather than structural – as decks are usually made from extremely durable woods or plastic composites. What are the most common maintenance issues? Discolouration – Decking boards which are particularly exposed to sunlight often suffer from the exposure to UV, which can cause discolouration & often leads decking boards to turn grey. Rot & Decay – Wooden structures can be susceptible to rot, even where they have been pressure-treated or oiled. Symptoms usually arise in the form of blackened wood, often on the deck surface. This is caused by high moisture environments and organic matter which may have gathered on the deck. Because rot often forms on the underside of boards or timber frames, sometimes it is only caught when the damage has already been done. Warping, Splitting & Cupping – Wooden framing & boards are more likely to suffer from this than plastics or composites. When timber gets wet & absorbs moisture, it expands. During warmer, dryer periods, the wood will then dry out and can often warp or split. Many notice that their boards sometimes ‘cup’ upwards or downwards after installation, which is a common symptom of this maintenance issue. Stains/Scratching – Decks can easily gather stains from a number of sources – un-galvanised nails or bolts might rust and stain the surrounding deck. Organic debris, dirt, bird droppings & moss can stain the surface; while footfall & decking furniture can cause scratches. Of course, there are countless other issues you might be unlucky enough to experience and after a few years, your deck could easily become weather-beaten & uninviting. 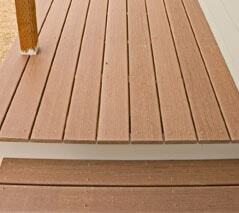 Protection: preserving your deck for as long as possible with a durable finish. Cleaning: cleaning your deck properly for a safe, long-lasting structure. Restoration: breathing life into a tired-looking deck, giving it a new look & feel. Painting: probably the final option if all else fails, painting over your treated deck for a brand new finish. Staining: changing the colour of your deck surface whilst protecting from outdoor conditions. See also our guide to staining pressure-treated decking boards. Pressure Washing: using a pressure washer to clean your decking surface. Follow these guidelines and you needn’t worry about UV damage, scratches, warping or that pesky rot & decay. We have the secrets to a long-lasting, healthy deck. We also have a guide on patio cleaning, which may be of interest if you’re renovating your outdoor areas.